Usually Ships in 6 Days. The Title "Orwell and the Politics of Despair A Critical Study of the Writings of George Orwell 1st Edition" is written by Alok Rai. This book was published in the year 1990. The ISBN number 0521397472|9780521397476 is assigned to the Paperback version of this title. This book has total of pp. 208 (Pages). The publisher of this title is Cambridge University Press. We have about 81824 other great books from this publisher. 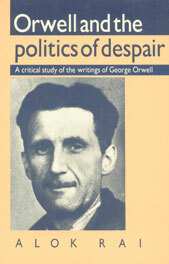 Orwell and the Politics of Despair A Critical Study of the Writings of George Orwell 1st Edition is currently Available with us.